Are your customers satisfied with the speed of your mobile store? Even if they are, you can surprise them providing even better m-commerce shopping experience. 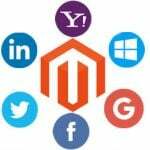 Install the Plumrocket Accelerated Mobile Pages (AMP) Magento 2 extension, and it will create highly optimized separate copies of all store pages. Why are these copies so fast? Because the Magento 2 module supports Google AMP Technology. 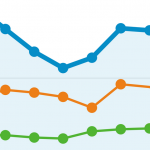 Thus, you can easily improve search engine visibility and consequently increase site traffic by using the tool. Below, we shed light on its core features. As a Magento 2 admin, you can easily edit the appearance of your AMP-optimized homepage on mobile devices right in the backend (we explore this functionality below). Note that optimized pages are loaded right from Google AMP Cache. Thus, they appear much faster in comparison with non-optimized ones. Besides, they are super lightweight and make minimum HTTP requests. In addition to speed improvements, the Accelerated Mobile Pages Magento 2 module applies some important SEO features. First of all, pages are enhanced with rich snippets. Next, you get the ability to track how visitors interact with your mobile pages due to the out-of-the-box Google Analytics integration. The third SEO feature is related to SERP. AMP-optimized content appears at the top of the Search Engine Results Page in the Top stories section. Besides, it can be marked with “lightning bolt”. 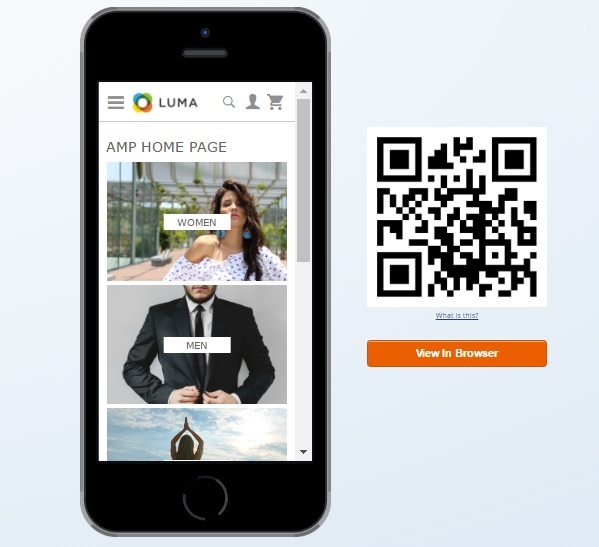 It is also necessary to mention that the Plumrocket Accelerated Mobile Pages (AMP) Magento 2 extension is fully compatible with all possible Magento 2 themes. You can use the module with either an existing third party solution or a custom one – the tool supports them all. Now, when you are familiar with the features and functionality of Plumrocket AMP Magento 2 module, let’s look under its hood and learn how everything works in the backend. 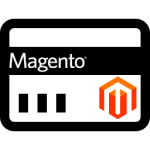 The configuration section of the Plumrocket Accelerated Mobile Pages Magento 2 module consists of 3 parts: General, Design, and Logo. 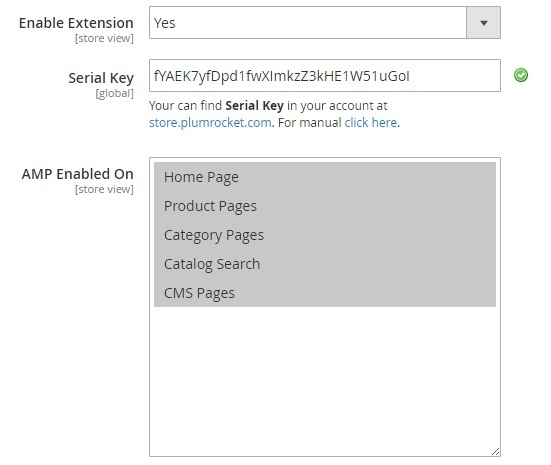 In General settings, enable the extension and enter its serial key which is available in your Plumrocket customer account. Next, decide for what paget to apply the module. You can enable it for the following store elements: homepage; product, category, and CMS page; and catalog search. Force AMP On Mobile Devices – this option allows to provide all mobile users with AMP-optimized content. If it is disabled, visitors who arrive not from a search result page will see non-AMP version of your store. Therefore, we recommend you to enable this option. Besides, you can implement the same feature for tablet devices – Force AMP On Tablet Devices. It is also possible to enable AMP Iframe with product options and specify its path. 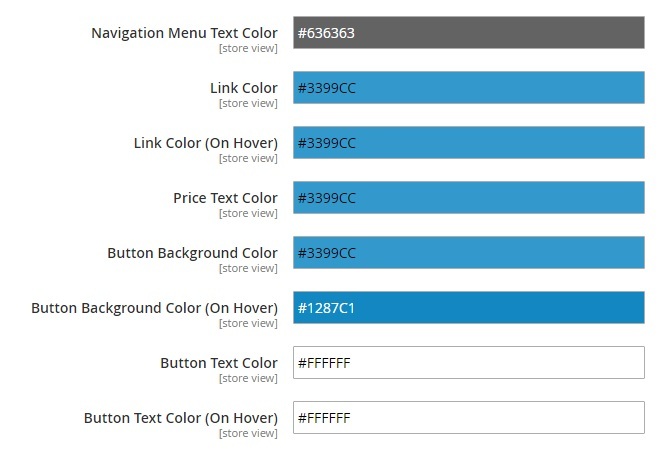 In Design Settings, you can set color for the following elements: navigation menu, link, link on hover, price text, button background, button text, and button text on hover. As for the Logo subsection, it allows to upload a new logo for mobile display and specify its width and height. M-commerce is rapidly growing since more and more customers use mobile devices for shopping. Therefore, it is extremely important to provide the best possible ecommerce experience for both smartphones and tablets. 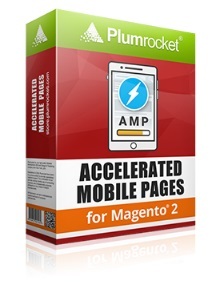 Choose the Plumrocket Accelerated Mobile Pages (AMP) Magento 2 extension and you will essentially speed up your Magento 2 storefront on non-desktop devices. The price of the module is $199, but there may be a 20% discount, so you can save almost 40 bucks.